Lifting of skin and fatty tissue – this is achieved with the physical and mechanical effects of the threads. Collagen stimulation and cellular renewal – the introduction of the threads and the PDO put the body into repair mode, sending collagen building agents to the area. This helps improve skin texture, repair elasticity and reduce fine lines and wrinkles. A thread lift is an amazing alternative for those who do not want to go under the knife for a full facelift or who want a more affordable option. 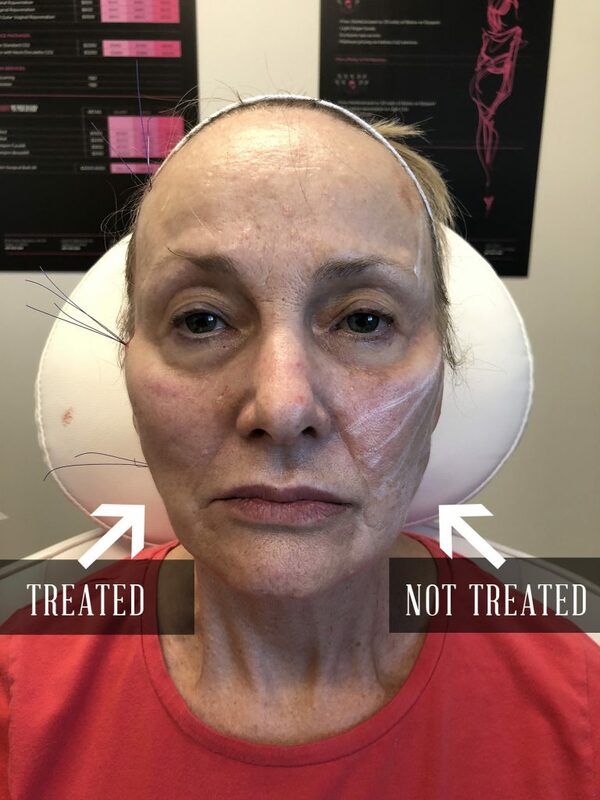 This non invasive facelift technique uses unique threads made of clear polydioxanone. The threads are carefully inserted through small strategic incisions using a large blunt tipped needle (cannula). 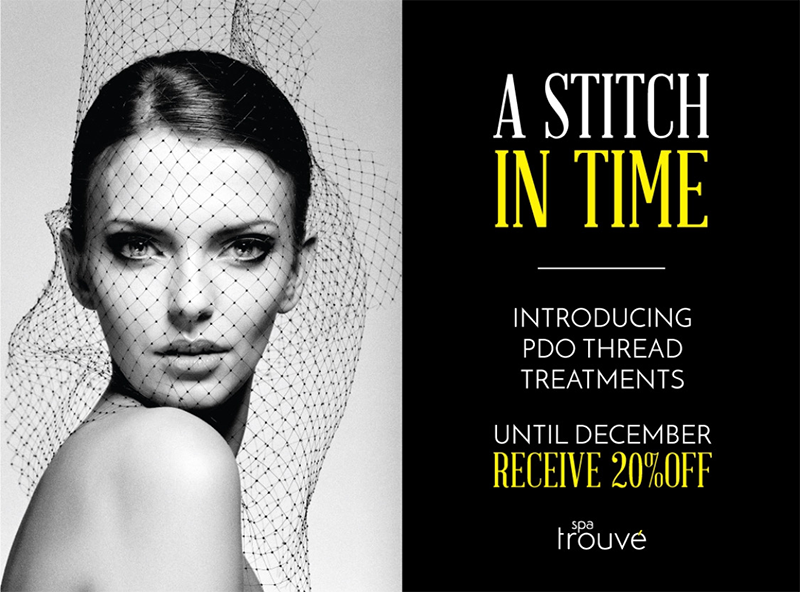 PDO Threads have small barbs on the end that grab and pull at the skin underneath the surface to lift and tighten it. There are many different types of PDO Threads and depending on the area, they can be inserted in different patterns or techniques. One type of thread can be put into the skin to create a mesh-like pattern that looks like a grid. After time, the skin will build new collagen around this pattern producing more volume and support in the treatment area. Alternatively, threads with small barbs can be inserted individually in strategic areas and used to grip and tighten the skin as needed. Do the threads stay in my body? Yes!The PDO threads are absorbable and after around 9-12 months they disappear. They’re surgical sutures that are made of a synthetic and absorbable polydioxanone, or PDO. They’re the same kind of sutures that are used in cardiothoracic (heart) surgeries. The benefits typically last for an additional 3 to 6 months. The new blood vessels and collagen produced remain. This non-surgical facelift treatment is minimally invasive. After a thorough consultation, our expert injectors will numb the treatment area. PDO threads are then inserted with cannulas into strategic layers of the skin. After the threads are inserted, they are gently pulled to anchor the skin and lift it upwards. Typically the treatment process lasts around 30 – 60 minutes. There is mild discomfort during the treatment process, but most clients report that it’s quick and tolerable. Can PDO Threads be combined with other treatments? Yes! PDO Threads work amazing when used in combination with other treatments such as Sculptra injections and Hyaluronic Acid facial fillers. Both can help stimulate collagen and tissue production to help balance out your facial structure and give a natural and youthful appearance. After a full consultation our expert Utah facial injectors will help set expectations, and will provide you with post treatment instructions. Interested in PDO Threads for a non-surgical facelift in Utah? Spa Trouvé is a top Utah provider of PDO Thread treatments and our expert injectors are experienced and highly qualified.